was born in Luxembourg, the fourth child of Otto von Habsburg. After graduating in 1976, Gabriela von Habsburg studied philosophy for two years at the Ludwig Maximilian University of Munich. From 1978 to 1982, she studied art at the Munich Academy of Arts with Robert Jacobsen and Eduardo Paolozzi. Since 2001, she has been an art professor at the Academy of Arts of Tbilisi, Georgia while also teaching at the Summer Academy of Arts in Neuburg an der Donau, Germany until 2005. She found the creativity and cheerfulness of her students in the face of the adversity then prevalent in Georgia inspiring. 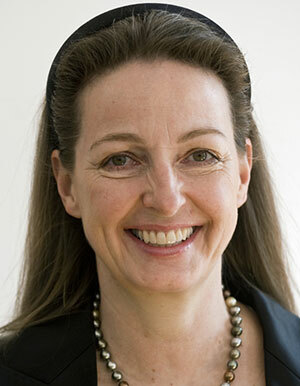 In November 2009, Georgia appointed Gabriela von Habsburg as its ambassador to Germany. Since March 2010 Gabriela von Habsburg represents Georgia at the International Council of the Austrian Service Abroad. Ambassador von Habsburg is also a prolific abstract sculptor, working mainly in stainless steel as well as stone-printed lithography.